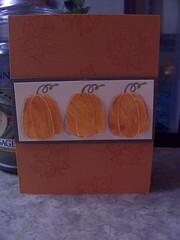 The card I'm sharing tonight was created for the fall foliage note card swap I am in on Paper Crafts site. I pulled out some new stamps from Clear Dollar Stamps to use. When I got the stamps they were smaller than I thought they would be but they are cute all the same. I took the opportunity to play with layering stamped images. I have a lot of practice to go to be as good at this as many other paper crafters are but I think the pumpkins turned out ok.